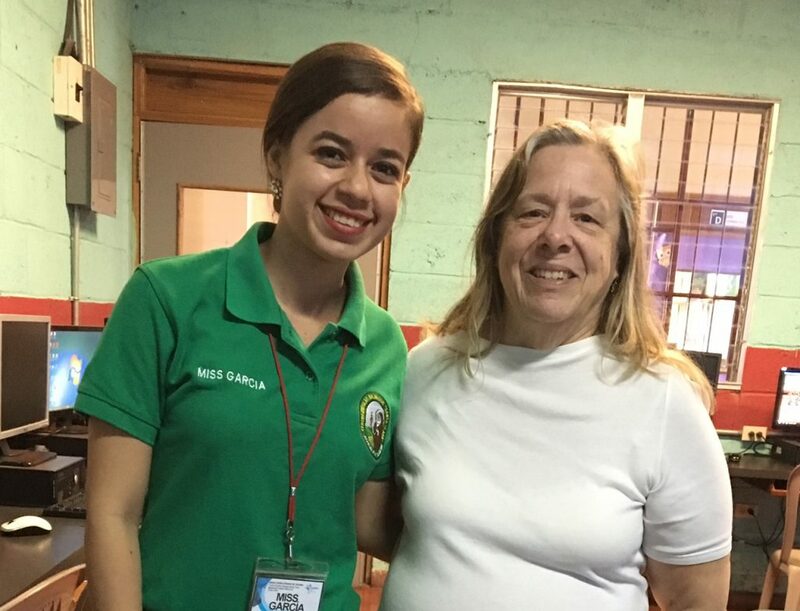 In November 2016, I came to Juticalpa, Honduras to work with Miss Alma Sagastume, the principal at Santa Clara Bilingual School, to develop an ESL program to improve English language skills for the teachers and staff at the schools. As a bilingual school, it is necessary that all staff have competency in spoken English and that classroom teachers also have fluency in reading and writing English. Ms. Sagastume’s goal was for teachers to prepare for successful completion of the Test of English for International Communication (TOEIC) certification. For teachers, attaining TOEIC certification is a big plus for their careers plus an advantage to the school to have TOEIC certified teachers. The first part of the process was to ascertain whether there was a need for this program at the school. I created tests for speaking, listening, reading, and writing in English. Between January and February 2017, 49 teachers and staff in the school and at Foundation were tested. 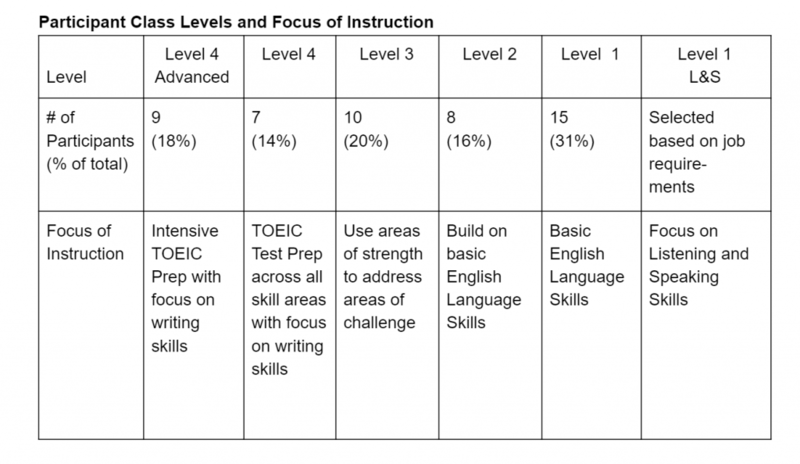 Results placed each participant at a level for instruction – Level 1 – Basic, minimal or no English skills; Level 2 – Beginning, some spoken English, but minimal vocabulary and grammar skills; Level 3 – Middle, with strengths in 3 of the 4 areas tested, but challenges in writing and vocabulary; and Level 4 – Advanced, ready to prepare for successfully completing the TOEIC exam. The final results showed 16 (32%) teachers and staff at the Advanced level who are ready for intensive TOEIC test preparation with a focus on improving writing skills; 10 (20%) of the teachers and staff were at the middle level and required instruction in all areas (speaking, listening, reading and writing) in order to prepare for the test; and 15 (31%) teachers and staff were at the Beginning level – this level included Spanish language teachers as well as support staff. Depending on their position at the school some staff would primarily need instruction in speaking and listening in order to communicate effectively with English speaking staff at the school. The tests determined that there was an overall need for ESL instruction for teachers and staff. The recommendation based on testing was that a full-time ESL teacher be hired to establish an ESL Academy for teachers. As of January 2018, an ESL teacher has been identified; Miss Krista Garcia has a university degree in teaching English as a second language. She will begin immediately testing new teachers and staff for placement in classes. Classes will be provided free to Foundation employees and occur beyond work hours so as not to interfere with work responsibilities. Classes will occur at one of the schools for the convenience of staff. The TOEIC organization has been contacted and approved on-site testing when we have students ready to successfully complete the exam, projected date June 2018. Future planning includes offering the test to members of the community for a fee to cover costs and providing free ESL classes for parents of students attending Olancho Aid schools. Establishment of the ESL Academy at Olancho Aid Foundation is a big step in assimilating our US roots into the Honduran school culture. Graduating from our schools or from the ESL academy with bilingual competencies is a great advantage for all in building bridges between cultures, people, and skills.